Air-actuated compliance allows for part variation. Historically, deburring and material removal has largely been a manual operation due to the limitations of previously available automated deburring tools. Conventional automated deburring tools can perform adequately along a straight edge or surface, with little or no compliance for cavities or protrusions, but these tools ultimately fail when part tolerances or paths are not exact. The Engineers at ATI have developed three types of compliant deburring tools that make automated deburring cells a safe, consistent, and economical process. What is a Robotic Deburring Tool? An end-effector designed with integrated compliance to perform deburring, deflashing, edge-breaking or surface finishing operations. Compliance motion compensates for part and fixture variability and maintains consistent force on the work piece. 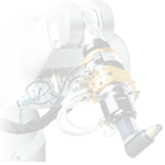 Robotic deburring tools can be mounted to a robot wrist for process-to-part operations. Deburring tools can also be mounted to a bench or fixture for part-to-process operations where the robot articulates the part around the tool. Robotic Deburring Tools may be air- or electrically-driven with various speed options and compliance ranges to accommodate a variety of applications. This tool features a robust interface to many common hand deburring blades. The CDB is suitable for a variety of robotic and non-robotic deburring operations on materials such as plastic, aluminum, steel, and brass. Also known as the Flexdeburr, these deburring tools are robust turbine-driven units for deburring a variety of materials with a robot or CNC machine. Radially-compliant deburring tools are especially suited for removal of parting lines or flash from parts. However, its flexible design allows it to be used in a variety of applications. Also known as the VersaFinish, these finishing tools are robust, low-speed, high-torque air tools with an axially floating spindle, suitable for a multitude of robotic and non-robotic material finishing operations on aluminum, plastic, steel, etc. Also known as the Speedeburr, these deburring tools utilize a vane-type motor and a floating rotary cutting file for edge-deburring and chamfering of parts using a robot.